Hip 898, Miss Exclusive, sells to Mt. 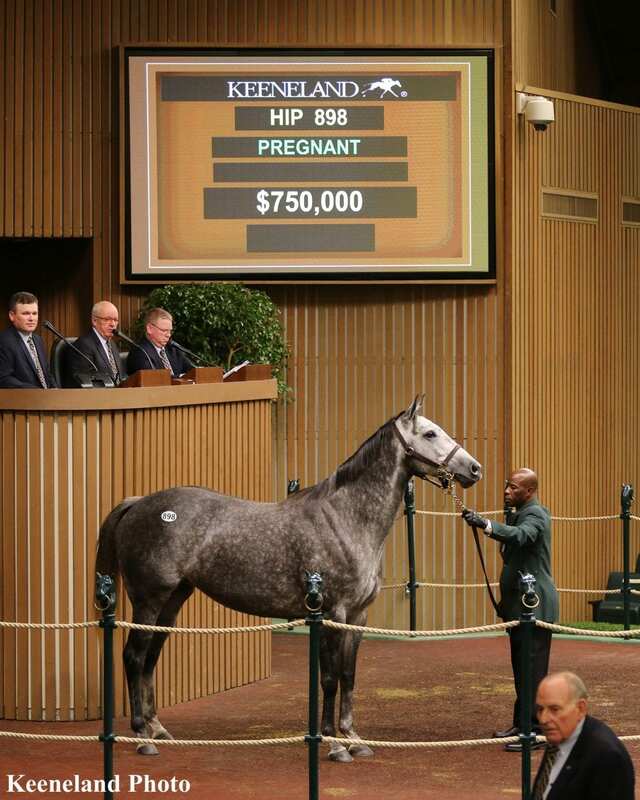 Brilliant Farm for $750,000 at the Keeneland November Breeding Stock Sale. The second half of Book 2 at the Keeneland November Breeding Stock Sale closed on Wednesday looking a lot like the first, topped by the $750,000 Miss Exclusive, hailing from the Juddmonte Farm broodmare band. Wednesday's session saw 231 horses sold for revenues of $33,856,000 for an average sale price of $146,563 and a median of $130,000. The buyback rate finished at 28 percent. Because of differing catalog arrangements between this year's Keeneland November sale and last year's, session returns are not directly comparable from year-to-year in the early books. Between the two sessions of this year's Book 2, the average sale price was down 6 percent from Tuesday's return of $156,691, while the median was up 4 percent from $125,000. While Russell lauded the activity by domestic buyers, he also noted that the Australian market had been more active than expected through the sale's first two books. At the end of three sessions, a total of 574 horses changed hands for revenues of $125,227,000. The average sale price sat at $218,166, the median was $150,000, and the buyback rate closed at 27 percent. Mt. Brilliant Farm landed the most expensive prize of Wednesday's session when it went to $750,000 to secure Hip 898, Miss Exclusive, a Juddmonte Farm-homebred broodmare. The 6-year-old Unbridled's Song mare was offered pregnant to Noble Mission for what would be her second foal. She had a colt by the same sire in 2017. Miss Exclusive raced twice, both times at Ellis Park as a 3-year-old for trainer Bill Mott. After finishing sixth in her debut, she returned to win her second and final start by 1 1/4 lengths, going a mile and a sixteenth on the turf. Miss Exclusive is out of the champion turf mare Intercontinental, whose four winners from seven runners also includes stakes-placed Abseil. Her second dam is the cornerstone Juddmonte broodmare Hasili, who had a quintet of Grade/Group 1 winners: European champion Banks Hill, Canadian Horse of the Year Champs Elysees, Cacique, Heat Haze, and the aforementioned Intercontinental. Hasili also had the G2 winner and prominent sire Dansili. “We'd been looking at her for a few days, and we tried to buy some of the family from Juddmonte at Tattersalls the year before last and we got outbid,” said Greg Goodman of Mt. Brilliant Farm. “We've wanted to be in the family and get a mare like this for a long time. We're excited to get that. Mill Ridge Sales consigned Miss Exclusive as agent for the Juddmonte operation. Wednesday's top weanling came late in the session when bloodstock agency Solis/Litt bought Hip 1013, a Tapit colt, on behalf of an unnamed partnership for $380,000. The dark bay or brown colt, born April 9, is out of the stakes-placed Candy Ride mare Sweet Dreams, whose first foal is an unraced 2-year-old. The extended family includes English Horse of the Year Dayjur, champion sprinter Gold Beauty, G1 winner Maplejinsky, G2 winners The Prime Minister and Strike Charmer, and multiple classic-placed Impeachment. Hidden Brook consigned the colt, as agent. This entry was posted in Bloodstock, NL List and tagged geoffrey russell, Greg Goodman, headley bell, hidden brook, horse auctions, juddmonte farm, Keeneland, keeneland november breeding stock sale, madison scott, Mill Ridge Sales, Miss Exclusive, Mt. Brilliant Farm, Solis/Litt, tapit by Joe Nevills. Bookmark the permalink.